Looking to take the Windows 10 plunge? We'll help you get the very best deal on Windows 10 Home or Windows 10 Pro. Last year saw the launch of Microsoft's latest operating system. It was much more warmly received than Windows 8, probably because the Start button is back. But also because it righted a lot of wrongs. In our Windows 10 review we said: "As an operating system for getting things done though, Windows can't be beaten. Apple's macOS is brilliant, but the sheer variety of devices that will run Windows 10 reveals that support from manufacturers is second to none." The new start button on Windows 10 splits the Start Menu into two, with the more traditional commonly used applications on the left and the Windows 8 tile styled menu on the right, for those with touch based computing. Despite appearances, the new Start menu does everything the Windows 7 equivalent did and more. 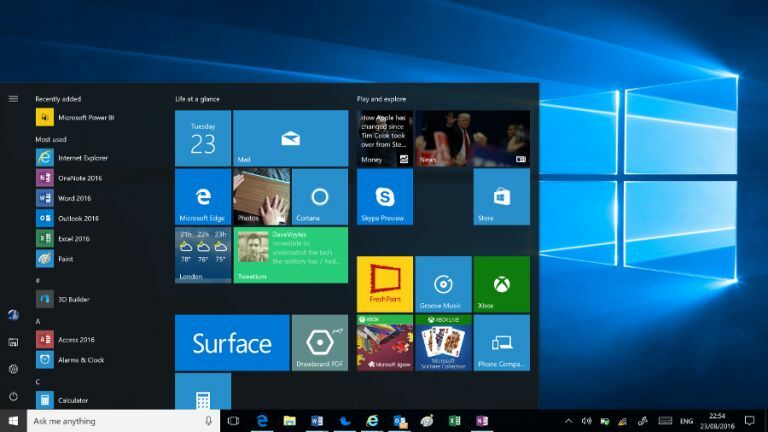 The familiarity should ensure that almost anybody can pick up Windows 10 and get going straight away. Although Microsoft tried to claim this was the case with Windows 8, it was plain wrong. The Windows 10 personal assistant - called Cortana - gets to know you over time and highlights your interests, like music and sport, that it thinks you would like. Unlike previous operating system versions, Windows 10 is compatible across all Microsoft devices, including PC's, tablets and smartphones. So if you're still using Windows 7 or Windows 8 it's high time to upgrade. We will be updating these Windows 10 deals every day, so keep checking back. The answer to whether you should upgrade to Windows 10 Home from 8 is a profound yes. Those on Windows 7 weren't so convinced, but now Windows 10 has completed a few improvement upgrades there is are plenty of new functions to be gained from upgrading such as Xbox One streaming, voice activated assistance from Cortana, Edge - Microsoft's new web browser, Windows Hello for logging into your PC via a fingerprint scanner or an image of your face and the Continuum method of switching between mouse and touchscreen control. Windows 10 Pro is designed for people running small to mid sized businesses. Pro comes with all the features of Windows Home but with additional benefits of security and management features. It includes Hyper-V for virtualisation, BitLocker whole disk encryption, enterprise mode IE, Remote Desktop, a version of the Windows Store for your own business and assigned access (which locks a PC to running only one modern application, to use like a kiosk). Network admins can also schedule updates so they don't happen at important times. Due to Windows 8 being such a disappointment, many people are uncertain about upgrading to Windows 10. Or they just want to stick with what their know, and Windows 7 is a reliable, usable product. Therefore, we have included some of our best deals for you to compare.